The region’s largest council and a number of its partners, including Durham Community Action, have signed a collective new pledge as part of an ongoing campaign to eradicate single use plastics. Representatives from Durham County Council were joined at its County Hall headquarters by a number of businesses and partner organisations to sign the bespoke local pledge for County Durham. The agreement commits all signatories to significantly reduce, and work towards ultimately removing, the use of unnecessary single use plastics from their operations. 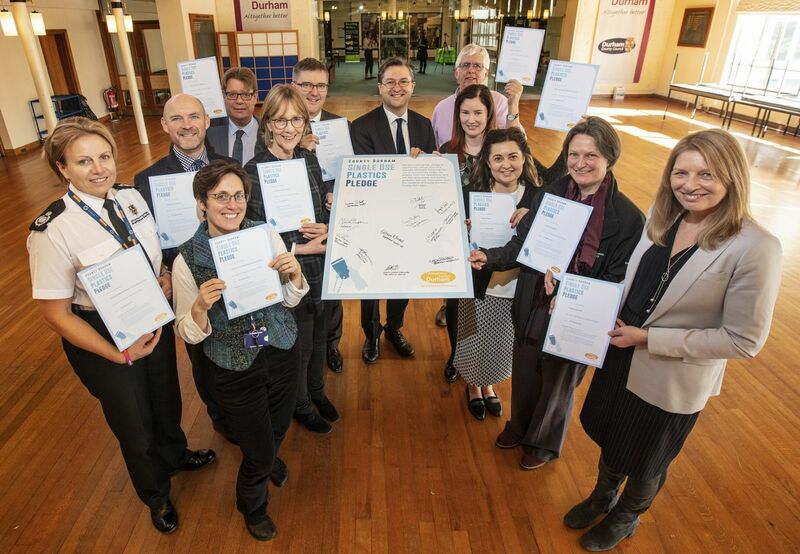 The Single Use Plastics Pledge was signed by Cllr Simon Henig as leader of Durham County Council as well as partners from Durham University; Durham Constabulary; Beamish Museum; The Environment Agency; Northumbrian Water; County Durham and Darlington Fire and Rescue Service; Durham BID; County Durham Housing Group; OASES; Durham Community Action and the North East England Nature Partnership. More organisations across County Durham are being invited to join up to add momentum to the campaign. Many of the partners have already reduced their consumption of single use plastics through a range of “early wins” such as eliminating plastic straws and cutlery, and reusing cups, and taking every opportunity to recycle the plastic we do use. Measures already being taken by the council include the phasing out the supply of blue plastic overshoes at its leisure centres, swapping plastic confetti at theatre shows for eco-friendly alternatives and even using recycling plastic products in an innovative road surfacing trial. Northumbrian Water has been promoting its Refill scheme which aims to reduce reliance on single use plastic bottles by encouraging businesses across the region to sign up to become Refill Stations, places where people can fill up their refillable bottles with tap water, free of charge. These range from cafés and restaurants to estate agencies. Durham University is trialling reusable boxes for students’ lunches, replacing disposable cups with mugs, glasses and reusable cups and planning to stock vending machines with cans, rather than plastic bottles. Cllr Henig said: “This pledge is not anti-plastic as we recognise its value to everyday life. What we are working together to reduce however is the throw-away materials, of single use, which not only can cause harm to our environment if disposed of incorrectly, but are also wasteful of resources. Oliver Harmar, area director, Environment Agency North East, said: ‘“Plastic waste is one of the most important issues facing our planet today and we need to take action now to significantly reduce plastic pollution and the impact it has on our environment. Northumbrian Water’s group commercial director, Graham Southall, said: “We’ve already started to reduce the use of plastics at source through our Refill scheme, offering a network of refill stations to help the public top up their water bottles for free. Signatories at the event viewed a video from Durham Heritage Coast Partnership showing a project in Finland, which was inspired by Durham’s work on the plastic free campaign. Another film showed the work that pupils at St Bede's RC Primary School in Sacriston have done to reduce plastic in their school. Information, guidance and support will be given to all signatories to the pledge, to assist them in auditing current use, and taking steps to eliminate or find alternatives.